Can Tracy Abrams be the Point Guard John Groce Needs? Things went well for John Groce in his first year as Illinois’ head coach. The Illini started the season 12-0, won the Maui Invitational for the first time in school history, beat #1 ranked Indiana in thrilling fashion, won an NCAA Tournament game (only their second since 2006), nearly upset #2 seed Miami in the Round of 32, and received commitments from two Top 50 recruits this summer. 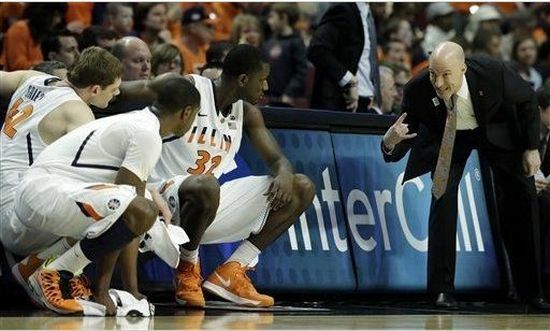 Groce did an impressive job motivating his team. Consider that the Illini had a 2-7 record in conference play in the beginning of February and closed the regular season 7-4 to make the NCAA tournament. The long term looks good for the Illini too. Groce has secured a top 10 recruiting class and is waiting on an influx of transfers who are scheduled to play next year. But this year, the Illini are expected to take a step back, only returning three players who logged significant minutes from last year’s team. Of these three, junior guard Tracy Abrams, and particularly his ability to play the point more effectively, may be the biggest factor that determines whether the Illini go dancing in consecutive seasons. Walker Carey is an RTC correspondent. He filed this report after the Round of 32 NCAA Tournament game between #2 Miami and #7 Illinois in Austin. The way Miami won this game was important. The Hurricanes have received a great deal of national attention due to the fact that their roster had zero NCAA Tournament experience before this year’s event. Miami coasted to an easy win over Pacific in its first game, but as a two-seed, that type of win is expected. Needing a test to prove its NCAA Tournament toughness, the Hurricanes definitely received one from Illinois. The Illini took a 55-54 lead with 1:24 to play and Miami kept its collective cool and was able to come back and grab the victory. On the possession after Illinois took the lead, Miami sophomore guard Shane Larkin nailed a ridiculously difficult step back three-pointer at the 1:04 mark to give the Hurricanes a two-point lead. Miami was able to maintain that lead and earn the victory by calmly going 6-of-6 from the free throw line down the stretch and not allowing Illinois to get anything easy on the offensive end of the court. Illinois deserves a lot of credit for the way it played. The Illini did not shoot the ball very well all night – just 37.7% from the field and 25.9% from three – but it fought hard all game and pushed Miami to the brink. In his postgame remarks, Illini coach John Groce spoke of how his team has battled hard all season and that they have gotten contributions from everyone all season. That was definitely the case against Miami, as different guys stepped up in different spots to make an impact. On a night where the usually solid D.J. Richardson was just 1-of-11 from the field, senior forward Tyler Griffey stepped up for the Illini with 12 huge points on a 4-of-6 performance from deep. Sophomore forward Nnanna Egwu was a force inside all night, as he finished with 12 points and 12 rebounds while playing very rugged defense against the Miami frontline. Senior guard Brandon Paul struggled at-times with his shot, but he certainly showcased his ability to take over a game with his performance Sunday night. The Illini might not have been victorious, but their effort and the way they played was certainly admirable. A blown call definitely had an impact on the game. When Richardson missed a three-point attempt with 43 seconds to play in what was a 57-55 game at the time, it clearly looked like the ball last touched the hand of Miami forward Kenny Kadji before going out-of-bounds. The ball was incorrectly rewarded to Miami, which resulted in guard Durand Scott nailing two clutch free throws to give the Hurricanes a four-point lead. While the Illini were able to trim the lead down to two again with 22 seconds to play, they never again had the chance to tie. There were many other reasons why Miami won and Illinois lost, but this call certainly had an impact on the last 43 seconds of what was a thrilling game. Star(s) of the Game. Rion Brown and Shane Larkin, Miami. The junior Brown was outstanding for the Hurricanes off the bench. He finished with 21 points on 7-of-14 shooting from the field and 5-of-10 shooting from deep. In a game where every shot was crucial, it seemed like every one Brown made was of great importance to the outcome of the game. Larkin turned in a normal stellar performance – 17 points and five assists – but the reason he makes this category is due to the ridiculous step back three-pointer he nailed to give his team a lead it would never relinquish with one minute to play. Under the assumption that a #16 seed won’t make history this year by beating a #1 seed in the round of 64, the Indiana Hoosiers should be able to handle the game against the winner of LIU-Brooklyn and James Madison. Ohio State was rewarded with the #2 seed out west because it won the Big Ten Tournament and should also be able to win its first game against Iona. The Gaels’ Lamont Jones (23.0 PPG) is a dynamic scorer whose impact should be mitigated by Aaron Craft’s superb on-ball defense. Even though the Hoosiers and the Buckeyes are clear favorites in their first game, the other five Big Ten teams – Michigan, Michigan State, Illinois, Minnesota, Wisconsin – will have their work cut out for them on Thursday and Friday. The following are some key thoughts around each team’s first match-up in the NCAA Tournament. Michigan vs. South Dakota State: This could be a trendy upset pick because the Jackrabbits’ Nate Wolters has been one of the hidden gems of the college basketball season. Wolters is more than just a scorer because he gets his teammates involved and will force the Wolverines to play effective defense. But let’s not forget that he will be exposed on the defensive end when guarding Trey Burke and as a result won’t be as fresh offensively. The Wolverines will benefit from playing in Auburn Hills where they will have a decent amount of support and it should help them beat the Jackrabbits to move into the next round. 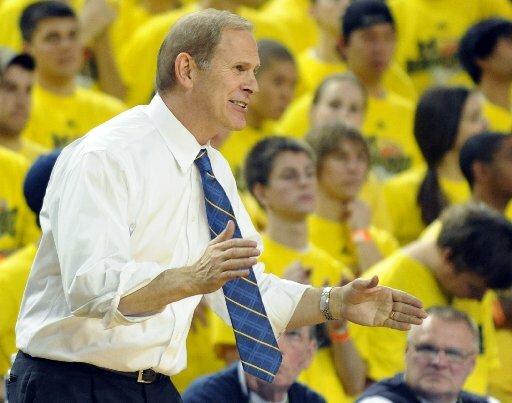 After playing teams very physical teams like Wisconsin and Michigan State, John Beilein’s team should be rejuvenated to play a team outside of the Big Ten who won’t necessarily try to slow down the pace of the game. If the Wolverines are allowed to run, they will take care of business comfortably on Friday. Michigan State vs. Valparaiso: Like the Wolverines, the Spartans will have a healthy amount of green and white represented in Auburn Hills for their game against the Crusaders. Bryce Drew’s team won’t necessarily wow you with its athleticism but the Crusaders score very well in the half-court. They have two versatile forwards – Ryan Broekhoff and Kevin Van Vijk – who can spread the floor, but the Spartans have the personnel to lock them down defensively. Branden Dawson and Adreian Payne are versatile enough to defend Valpo on the perimeter and can dominate the boards which will make a big difference in the game. It’ll be interesting to see if Keith Appling can get some of his confidence back because assuming they move onto the Third Round, Tom Izzo will need him to be very effective in the final minutes. Walker Carey is an RTC correspondent. He filed this report from the Big Ten Tournament at the United Center following Friday’s matchup between Indiana and Illinois. You can follow him at @walkerRcarey. Cody Zeller was dominant. The All-American big man picked up where he left off after a sensational performance in Sunday’s victory over Michigan. Once again, Zeller was the go-to guy for the Indiana offense against Illinois, as he finished the afternoon with 24 points and nine rebounds. With the ball in his hands on the low block, the talented sophomore was able to do pretty much whatever he wanted against the Illini interior for the duration of the game. 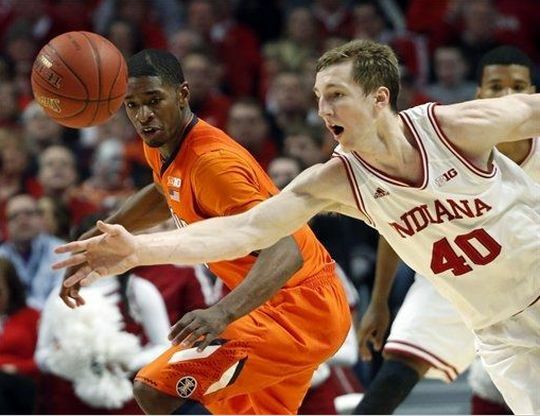 Zeller’s presence on the defensive end of the court was also quite notable as he anchored a Hoosiers’defense that did not let anything come easy for the Illinois offensive attack. There have been instances this season where Zeller’s production has not matched his level of talent, but if he can continue to put forth performances like he has in his last two games, there will be no ceiling on Indiana’s postseason hopes. Indiana’s defensive effort in the first half was phenomenal. ESPN analyst Dan Dakich tweeted at halftime that he and legendary Indiana radio announcer Don Fischer believed that the first half against Illinois was the best defensive half that the Hoosiers had played all year. The two men had a point as the Hoosiers were just suffocating on that end of the court for the first 20 minutes. The Illini were held to just 25.9% shooting in the first half and had to settle for many difficult looks due to the intense defensive pressure. The Hoosiers also forced Illinois into eight first half turnovers – many of which resulted in great transition opportunities. 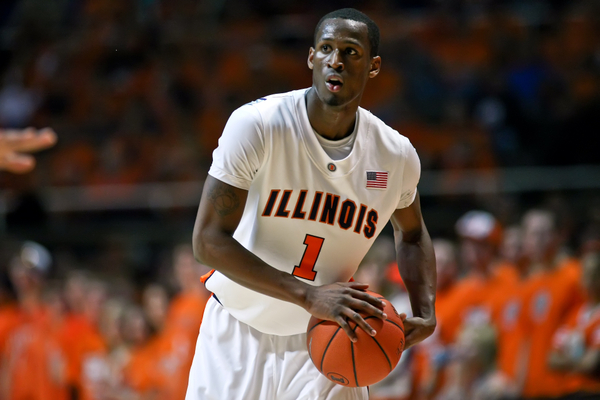 Illinois guards Brandon Paul and D.J. Richardson were a combined 3-of-13 from the field and by containing the Illini’s two best scorers, Indiana was able to open up a 14-point halftime lead. Victor Oladipo rightfully gets most of the credit for Indiana’s strong defensive performances, but the Hoosiers have really made strides as a team in-terms of their defensive effort. Both Illinois and Minnesota are probably far too inconsistent to make any noise in the NCAA Tournament. The Fighting Illini and the Golden Gophers have struggled with consistency issues all season and all Thursday’s game proved was that neither team has alleviated those issues. If you recall, both teams started the season red hot — the Illini were once 12-0 and the Gophers were once 15-1 — but after Big Ten play commenced, both squads began to struggle. Both teams finished their conference slates with an 8-10 record. While such a record would usually not raise many eyebrows, Illinois and Minnesota have grabbed a lot of national attention due to some impressive victories and some head-scratching defeats. The Illini scored great victories over Ohio State and Indiana, but they also were defeated at home by a Northwestern team that finished 11th in the conference. Minnesota notched wins over Michigan State, Wisconsin, and Indiana, but Tubby Smith’s squad also suffered setbacks to Northwestern and Nebraska. It is fair to assume that both teams are solidly in the field of 68, but when you have to question what version of both teams will show up, it is also fair to assume that both teams will not be in the tournament for long. Throughout his career, Brandon Paul has been touted as an ultra-talented player who struggles with inconsistency. Sometimes he showcases his impressive range and versatility, while other times he seems to disappear from the moment. In Thursday’s opening round Big Ten Tournament game, Paul rose to the moment, and then some. He scored 25 of the Illini’s 51 points on 10-of-16 shooting, and was 4-of-8 from beyond the arc in his team’s victory over Minnesota. But he saved his best for last, hitting a 15-footer at the buzzer to get his team a date with Indiana in the second round of the Big Ten Tourney on Friday. Other than Paul, Illinois struggled mightily. Its next three leading scorers — D.J. Richardson, Tracy Abrams and Nnanna Egwu — each had just six points. Paul, a guard, was the second-leading rebounder with five, just one behind Egwu. And while Paul shot 50 percent from beyond the arc (4-of-8), the rest of the team was just 2-of-17 from long distance — Tyler Griffey was 0-of-4, Abrams was 0-of-3. Illinois’ season has taken after Paul’s career, in a way. 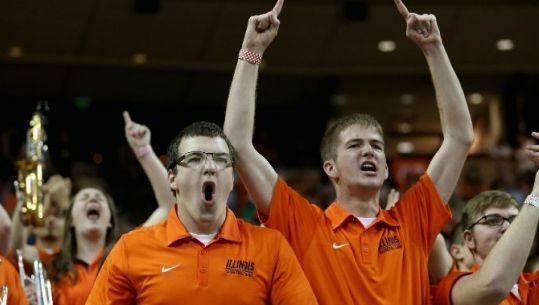 The Illini have lived and died by the three, which essentially means inevitable inconsistency. On nights when they’re firing on all cylinders, they’ve pulled out impressive wins against Butler, Gonzaga, Indiana and Ohio State. However, cold-shooting nights have led to bad games — a 14-point home loss to Northwestern and near losses to Gardner-Webb and Auburn. The good wins have offset the bad ones, and they’re why the Illini will surely be dancing next weekend. March is upon us and as teams wind down their regular season over the next week, they will also honor the senior classes during the last home game. Illinois seniors – D.J.Richardson, Brandon Paul, Sam McLaurin, Tyler Griffey – did not want to lose their last home to Nebraska, a team that they couldn’t afford to lose on Saturday. Fortunately for them, Tracy Abrams chipped in 16 points to lead the Illini to a 72-65 win over the Cornhuskers and the seniors were very emotional in Champaign. 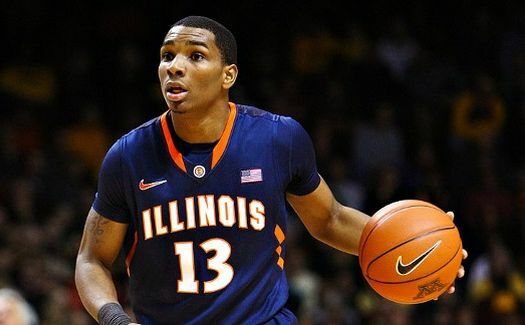 “I was under my shirt crying,’’ said guard Brandon Paul, who evidently shed a few tears after the grind-it-out victory. The Illini finish the regular season with two road games against Iowa and Ohio State; they could use one more win to lock in a good seed for the NCAA tournament. While the Illini seniors won their last home, the Badgers’ senior class were upset by the Boilermakers on Sunday. Matt Painter’s team stunned the Badgers by beating them 69-56 and dominated for most of the second half at the Kohl Center. Mike Breuesewitz, Ryan Evans, and Jared Bergren shot a combined 9-24 from the field in a loss that will be booked under the “bad” category by the selection committee on Selection Sunday. “They were just hitting tough shots. This game kind of reminded me of the Cornell game my freshman year,” Evans said, referring to the 2010 NCAA tournament game in which the Big Red shot 61.1 percent from the field and 53.6 percent from three in an 87-69 defeat of the Badgers. Fran McCaffery’s Hawkeyes have had some issues offensively over the past two weeks and the first half against Indiana over the weekend was no different because they only scored 14 points. The Hoosiers led 26-14 at the halftime and pulled away to win 73-60 at home as they inch towards a Big Ten title. “I wouldn’t call it a freeze-up,” Iowa coach Fran McCaffery said. “It was a really good defensive effort by a good defensive team.” The Hawkeyes can’t afford to fall behind in the first half on Tuesday against the Illini because they could really use that game to make a case for the Selection Committe that they deserve a bid to the NCAA tournament. Speaking of the Hoosiers, freshman Yogi Ferrell scored a career-high 19 points and dished out five assists against the Hawkeyes. Senior guard Jordan Hulls has struggled against Iowa, shooting 0-17 during the two games this season, but Ferrell had a huge offensive game. After the game, head coach Tom Crean said, “Tonight he went to the rim and didn’t try to get the contact. In the Minnesota game, he tried to get the contact, and he didn’t get either. Tonight he really focused on making the basket, and he did a much better job with that.” Ferrell hasn’t carried the offensive load this season but having a game like this one should help his confidence as the Hoosiers get ready to make a run at the Final Four and potential the national title. Deepak is a writer for the Big Ten microsite of Rush The Court. Follow him on Twitter for more about B1G hoops at @dee_b1g. About a month ago, Illinois was reeling in the Big Ten because they were upset by Northwestern in Champaign. The 68-54 loss came at the worst time after they were hammered by the Badgers in Madison four day earlier by 23 points. The loss to Purdue to kick off the Big Ten season could have been put aside as an aberration, but the loss to the Wildcats proved that the Illini would have to earn every one of their wins in the Big Ten. But a month later, optimism may be back again in Champaign as they returned the favor to the Wildcats in Evanston with a 62-41 route last night. John Groce‘s team hasn’t really changed their offensive philosophy during the last month – they still depend on the deep shot for most of their offense but senior D.J. Richardson has turned it up over the past four weeks, regardless of the outcome of the game. He has averaged 17.5 PPG and 4 RPG over the last eight games and has clearly asserted himself as the leader of the team during the tough stretch. 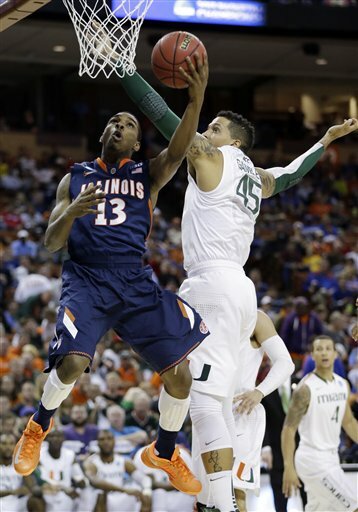 Senior guard D.J.Richardson has been the key to Illinois’ turnaround over the past few weeks. Fellow senior guard Brandon Paul is still the best scoring option but Richardson is their best shooter from beyond the arc and has been their best defender on the perimeter. During the 1-4 start in conference play, the Illini went cold from the long range and appeared clueless on defense. Something had to change and it started with defense as Richardson led the charge. The same Wildcats team that shot 8-15 (53% 3FG) from beyond the arc in Champaign couldn’t find the rim last night as they shot just 5-27 (18% 3FG) from deep. Richardson’s efforts were not fruitful immediately because they lost three more games to Michigan, Michigan State, and Wisconsin, but the perseverance paid off as he scored 23 points against Indiana and the Illini finally cracked through in the Big Ten against a top team to save their season. Tyler Griffey‘s last second layup has been well publicized but without Richardson’s intensity, the game wouldn’t have been tied at the end. While this weekend’s slate of games doesn’t quite match last weekend’s, there are several conference match-ups that are vitally important in the Big Ten, ACC, and Mountain West. The theme of the weekend is “must win”. The action should be great, so don’t sleep on these games. Let’s get to the breakdowns! Louisville is trying to avoid a three-game losing streak, as they head on the road to Georgetown. Another loss by the Cardinals and Rick Pitino may have to do some reevaluating or reshuffling. For Georgetown, a fourth loss in the Big East this early would certainly put them on the verge of irrelevance. This game is the first of three straight home games for the Hoyas before heading on the road to Rutgers. If they can string together some wins prior to their match-up against Marquette next month, the Hoyas can keep themselves in the thick of the Big East race. In Louisville’s two losses to Syracuse and Villanova, they have struggled against the length of both teams. They simply could not get good shots over the taller players from the Syracuse and Nova. They shot 46.6% eFG and 44.8% eFG against those two teams. Georgetown is another long team. In order for Louisville to avoid a three-game skid, they must figure out a way to hit shots. Creating turnovers without capitalizing on them will not get it done on the road. The Hoyas on the other hand still need to protect the ball and play at their pace. If they are turning the ball over, which they have been doing in conference play, and the pace speeds up, it will be a big problem for John Thompson III‘s squad. Minnesota has lost three straight games while Wisconsin has lost two straight. Because the Big Ten is so tough this year, it’s too early to say that either team would be out of the race with another loss. However, it will make things much more difficult. The Gophers are struggling on defense in conference play and when they get aggressive, they are fouling. They are also turning the ball over at a rate of 24%. This isn’t the same team we saw in non-conference play. They have put themselves in a must win situation very early in Big Ten play. Similarly, Wisconsin is struggling after their big win against Indiana. They need to continue to play at their pace. If Minnesota can speed this game up with its great athletes, Wisconsin will have a tough time competing. Play close attention to Jared Berggren on the glass. He has to have a monster rebounding game in order for the Badgers to win. If Wisconsin can find a way to get to the line, they can make it four losses in a row for the Gophers.